That’s an amazing piece of writing about the Mennonites. Frankly, I know nothing about these people. In this age where just about everyone is craving after modern lifestyle, that these people are self sufficient by their own initiative, belief and routine is amazing. You missed the point? I would love to help clarify what you missed, but I am not too sure what you mean here… It seems like we are missing each other’s point! Great article. My family and I are thinking of relocating to Belize to start a Christian community with 5-10 other families and would like to know if there is any reasonable properties around for such a venture. Also, are there any non-malaria spots in Belize as malaria freaks my wife out! 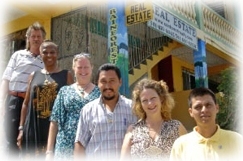 Did you get help with your family in looking into Belize to move to ? There are a lot of properties for sale in Belize, and they vary a lot on what they offer. You can have jungle or ocean, be on the grid or not, mountains or flat land… Prices also vary a lot regarding of the location and what the property offers (ex: off-grid is much cheaper than on the grid or close to a town, are there existing buildings or will you have to build from scratch, etc.). I don’t know if you have already been to Belize, but if not, my suggestion is to come for at least a week and tour the country. You will see how diversified it is! From there, it is to pick the area you prefer, write down your criterias (grid or off-grid, with or without building(s), etc.) and search the properties available in that area. I have read every blog you have and looked at all the pics. Question: Why didn’t the walls around the bathroom go to the ceiling? I mean the cats love it but I was wondering why you do that. I have been taking notes from all your stuff. (like the solar guru info) Let me tell you girl if we hadn’t had such a financial setback last year, I’d be down there tomorrow. I want to pick all your brain cells before you leave. I adore your kitties. Have a great day and I have Belize envy big time. The walls around the bathroom (that would be the one in the cabana) don’t go to the ceiling for better airflow. And of course, when it’s fun for the kitties, it’s even better! I sure hope you can make your dream come true! My husband said the only thing he would add there would be a little hot tub or pool with a wooden dock by the creek. We adore the creek pics. Hubbie said little fishes or not he is going in naked. We are nudist at heart. I said he better beware of the mighty ‘little wennie” fish. They make decide to nibble and eat…. LOL! Silly guy fell for it. I had to tell him the truth that there was no such fish… Sometimes he is just plain slow. He had a question for you. When it rains how far up has the creek risen. I see the house has a lower back side; does the water get up on that corner of the house? A hot tub might be nice in the winter as it does get quite cold, especially at night. But then you have to think of the power you’d need to heat up that water! As for a pool, the creek is so much better and definitely more refreshing when it gets real hot like it is right now. As far as a dock by the creek, during rain season when we have real good tropical downpour, the creek rises, and sometimes by a lot… so the dock might not be there once the creek subside, as when it is high, the current can get extremely strong. The house and cabana are built high up and when the creek is at it’s highest, such as last October during the flood, it did not come nowhere near the buildings. Does the creek have any edible size fish and if so what kinds? Lots of fish in the creek, but no real big ones. There are Cat Fish and a variety of Tilapias. I also sometimes see turtles and crabs. great blog,i found it through a friend of mine brad , i believe he is buying the property off you,he is a great guy and your property is right up his alley, i was wondering why are you moving away from paradise? thank you for your time..
Brad and Maureen are awesome! Yes, they have bought, it should finalized by the end of the month. They stayed in the cabana for a few nights, and yes, the property is right for them! 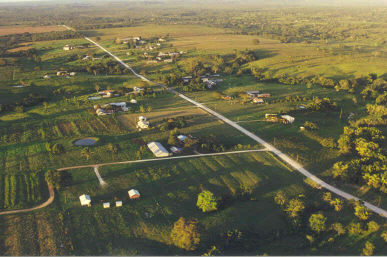 We live in central Tennessee and are located between two Amish farms. Our Amish neighbors are extremely traditional (no electricity, phones etc) and are simply awesome! Do you know where in Belize the more traditional Mennonites are located? Just curious. Many Barton Creek Mennonites are from Tennessee, and they are as traditional as the Amish surrounding you. I am sure there are other traditional Mennonites communities in Belize, but I am not sure where they are located. They truly are wonderful people and neighbors! I like your articles. My gal and I own a farm near Punta Gorda but we live in San Francisco for the time being. W have a small Mayan house but are planning on building a home on the farm in 6 months to rent out for a week or two at a time and eventually move down permanently. Do you have a recomendation on an Amish or Mennonite builder you might recommend? Love your pics on the Mennonites,as I know alot of the Old Order Mennonites in Barton Creek and Springfield. Can you please get in contact. I am doing some research on the Armish Communities of Upper Barton Creek, Lower Barton Creek and springfield in Belize. Can you send me your email so we can get in contact please. J’ai beaucoup apprécié votre post sur les Mennonites, qui m’intéressent énormément ! En fait, je prépare un voyage à Belize dans le courant de l’été 2012, avec mon mari (irlandais, moi je suis française), pendant environ 1 mois, en vue de rechercher un terrain pour construire et vivre les quelques 20 ou 30 années qui nous restent (58 et 61, jeunes et sportifs ^^) ; je suis en contact avec Macarena Rose et d’autres “realtors” mais je cherche une opinion indépendante sur la vie à Belize, les gens, le climat, le contexte social et économique, bref, un point de vue qui ne soit pas “commercial” mais objectif et”vécu”. Nous avons vécu 25 ans en Martinique, donc les moustiques, serpents, pluies diluviennes et fortes chaleurs, on connaît. Accepteriez-vous d’échanger votre expérience et répondre à nos questions par mail ? I met a large Mennonite family on the way from Mexico into Belize not quite two months ago. Since we traveled together on a small bus into the center of the country, we had ample opportunity to discuss many things. It was interesting to hear about the sect and its history in Belize first-hand. Hey there thanks for the article! Do you know of any way to get in contact with a mennonite or amish family down there?